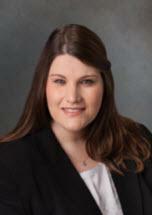 Carlie C. Gause joined the firm in May 2013. She received her Bachelor of Science in Sociology from Texas State University in 2006 and her Master of Arts in Legal Studies from Texas State University in 2009. She received her Juris Doctor degree from Texas Wesleyan University School of Law in 2012, where she served as Notes and Comments Citation Editor for the inaugural Issue of the Texas Wesleyan Real Property Journal (2011-2012). While at Texas Wesleyan, she served as Vice President for Phi Delta Phi Honors Fraternity (2011-2012). Prior to joining the firm, she clerked for Dunnam and Dunnam, L.L.P. and volunteered her legal services at Friends for Life, a nonprofit benefiting the elderly and disabled. A native of Waco, Carlie remains active in the community, focusing her time on helping families who have children with special needs and the elderly. Carlie is an active director of the Arc of McLennan County. She is currently serving her third term as Vice President and Chair of Fundraising. Carlie and her husband, Joseph, and their son live in Hewitt. In her free time, she enjoys spending time with her friends and family, traveling with her family, party and event planning, and scrapbooking.